PRAGUE depicts an intentionally lost Lost Generation as it follows five American expats who come to Budapest in the early 1990s to seek their fortune — financial, romantic, and spiritual — in an exotic city newly opened to the West. They harbor the vague suspicion that their counterparts in Prague, where the atmospheric decay of post–Cold War Europe is even more cinematically perfect, have it better. Still, they hope to find adventure, inspiration, a gold rush, or history in the making. What they actually find is a deceptively beautiful place that they often fail to understand. What does it mean to fret about your fledgling career when the man across the table was tortured by two different regimes? How does your short, uneventful life compare to the lives of those who actually resisted, fought, and died? What does your angst mean in a city still pocked with bullet holes from war and crushed rebellion? Journalist John Price finds these questions impossible to answer yet impossible to avoid, though he tries to forget them in the din of Budapest’s nightclubs, in a romance with a secretive young diplomat, at the table of an elderly cocktail pianist, and in the moody company of a young man obsessed with nostalgia. Arriving in Budapest one spring day to pursue his elusive brother, John finds himself pursuing something else entirely, something he can’t quite put a name to, something that will draw him into stories much larger than himself. 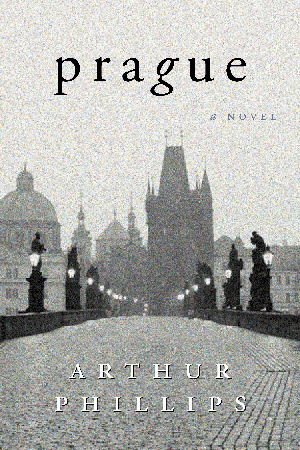 “In PRAGUE, Arthur Phillips spins the Jazz Age novel. His expatriate Americans have settled in Budapest rather than Paris, and instead of champagne and ragtime, they outfit themselves with Gauloises, paprika-dusted sandwiches, punk rock, and post–Cold War irony. But their passion—to know America and to shrug it off—is timelessly literary. A hip-hop remix of Fitzgerald and Hemingway, a meditation on a generation, a polemic, a love story, a new branch of sociology, PRAGUE tries to do it all and succeeds.